Class II cavity prepared in upper first bicuspid, mesio-occlusal surfaces, for the reception of gold foil as the restorative medium. 1. Structural defects and any undermined enamel are removed. Entire central groove area is included. 2. Surrounding walls are extended to provide for the manipulation of the gold foil and the proper finishing of the margins of the restoration. 3. Distal wall parallels the distal marginal ridge and meets the buccal and lingual walls at a definite sharp angle. 4. Buccal and lingual walls extend to blend harmoniously with the corresponding walls of the proximal portion of the preparation, and to provide for access to the interior of the proximal portion of the cavity during insertion of the gold foil. This usually requires a reverse curve in the buccal wall where the occlusal portion meets the proximal wall. a. Placed so gingival margin is uniformly about halfway into the depth of the free gingival crevice. c. Meets the buccal and lingual walls at a definite angle. The bucco-gingival angle is usually approximately a right angle or obtuse angle. The linguo-gingival angle is acute. Note: In the development of the outline form it is essential that the gingival wall be established first. The position occupied by the gingival wall determines the outline form of the entire preparation. This maxim holds true for all proximal cavity preparations. a. Include defective or carious area. b. Extended to areas of the tooth surface which are less susceptible to recurrence of decay. c. Placed in areas which are capable of being finished readily. d. In view of the demands of esthetics and inconspicuousness, in the natural tooth the buccal margin clears the approximating tooth by 1/2 - 3/4 mm. Viewing it at an angle perpendicular to the tangent it is straight from occlusal to gingival; sighting it from over the mesial approximating tooth it is, in general, parallel to the contour of that tooth. e. The lingual margin uniformly clears the approximating tooth by 1 mm. b. 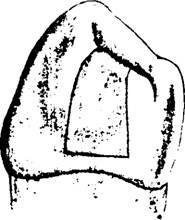 At right angles to the long axis of the tooth (Fig. 28). c. Established just within the dentin (Fig. 27). b. Meet the pulpal wall at a right angle except at the isthmus where the angle is slightly obtuse (Fig. 28). 3. 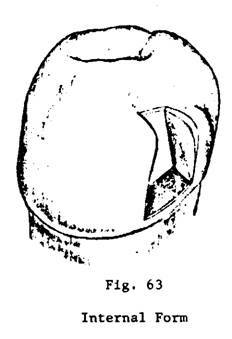 Buccal wall follows into disto-buccal developmental groove slightly, to form a dovetail (Fig. 25). 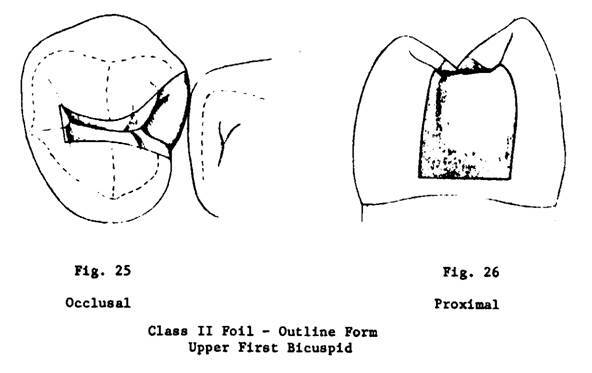 b. Parallels the distal marginal ridge (Fig. 25). c. Meets the buccal and lingual walls at sharp angles. d. Forms an obtuse angle with the pulpal (Fig. 27). 5. The reverse curve in the buccal outline follows through the whole wall as the occlusal portion meets the proximal portion. 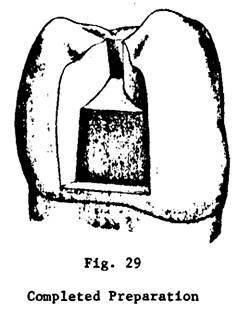 This opens the "throat" of the cavity and allows better access with the condensing instruments (Fig. 28). b. Basically at right angles to the long axis of the tooth bucco-lingually, dependent on requirement that this margin must be under the normal free gingival tissue. c. Slopes in to the axial to meet that wall at a slightly acute angle (Fig. 27). d. Axio-gingival line angle is established just within the dentin but is slightly deeper axially than in a preparation for a gold inlay. e. Meets the buccal and lingual walls in clean sharp definite angles. a. Meet the axial wall at a right angle or very slightly obtuse angle (Fig. 28). b. Are on a plane parallel with that of the enamel rods. a. Parallel with long axis of tooth (not with surface contour as in the Class V Foil preparation). d. Meets pulpal wall at definite sharp angle. 4. Bucco-axio-gingival and linguo-axio-gingival point angles are definite, sharp and slightly acute (Figs. 27 & 29). 5. Bucco-axial line angle and linguo-axial line angle fade into buccal and lingual walls respectively of the occlusal portion of the cavity (Fig. 28). 1. Convergence occlusally of buccal and lingual proximal walls. 3. Slightly acute axio-gingival line angle. Is necessary to enable adequate line of force for compaction of the gold foil. The only special provision is the establishment of the reverse curve in the buccal wall. Otherwise the requirements are met by having clean sharp line angles, point angles and proper outline form. 1. The enamel walls are planed smooth. 2. Walls must have full length enamel rods, supported by sound dentin. 3. A very light bevel is usually required on the occlusal cavosurface margin, and is sometimes needed on the gingival cavosurface margin to avoid short unsupported enamel rods (Figs. 27, 29). 4. The cavosurface angle presents a continuous, smooth line devoid of irregularities. Class II cavity prepared in the mesial surface of lower first bicuspid, for the reception of gold foil as the restorative medium. This cavity, a variation of the typical Class II preparation, was developed by W.I. Ferrier. 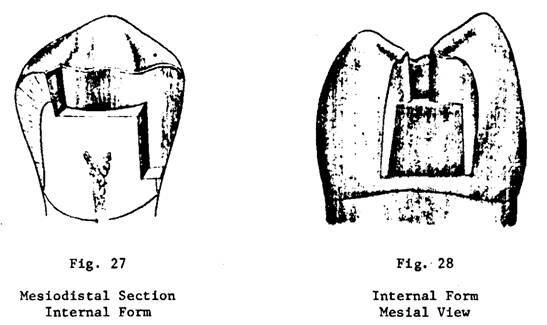 It is prepared as a proximal box form only, with no occlusal step, and is used only in this location, since the mesial marginal ridge of the mandibular first bicuspid normally is not subject to functional stress, yet minimal display of metal is highly desirable, It is simple in form, but requires precise, delicate execution. 1. Very restricted preparation. Mechanical separation is utilized to reduce buccal and lingual extensions. a. Placed uniformly within gingival sulcus. c. Meets buccal and lingual outline at a definite sharp angle. b. Clear labial and lingual distal line angles of cuspid crown uniformly, by approximately 1/2 mm on the buccal and 3/4-1 mm on the lingual. c. Esthetics is the guiding factor for the buccal extension, while prevention of recurrence predominates for the lingual extension. The lingual is therefore usually somewhat greater. d. As in any proximal outline where esthetics is important, it is straight from occlusal to gingival when viewed at an angle perpendicular to the tangent; sighting from over the cuspid it is, in general, parallel to the contour of that tooth. 1. 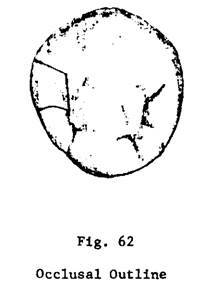 Is formed by the occlusal extension of the proximal box. It is a simple rectangle in form. 2. The distal outline is flush with the depth of the axial wall. Occasionally some slight variation in form may be necessary if the mesial triangular groove or mesial pit closely approximates the mesial outline. 3. The lingual outline sometimes has to be extended somewhat, if the proximal lingual wall opens to the occlusal very close to the mesial spillway. 4. The distal wall meets the buccal and lingual walls at a definite angle. 1. The only resistance form required in this preparation is that which is needed to withstand the forces applied for the compac­tion of the restorative material, for the mesial marginal ridge of this tooth usually is not in functional occlusion. b. Perpendicular to plane of occlusal stress. c. Deep enough so axio-gingival angle is within the dentin. It is somewhat deeper than would be required for a cast resto­ration, so there will be adequate bulk of foil. a. Each is in a single plane from cavosurface to axial wall. b. Meet the axial at an acute angle. c. Meet the gingival wall at a definite, sharply defined angle. d. Generally straight throughout the occluso-gingival length. a. Deep enough to be in dentin. b. Flat occluso-gingivally and bucco-lingually. c. Generally parallels long axis rather than mesial contour of tooth. d. Meets gingival, buccal and lingual walls in a definite acute angle. 1. Convergence gingivo-occlusally of the buccal and lingual walls. 2. Slightly undercut buccal and lingual walls. 3. Sloping of gingival wall in a gingival direction from cavosur­face to the axial wall to form a slightly acute, axio-gingival angle. 4. Sharp, definite line angles and bucco- and linguo-axio-gingival point angles. 5. Compressibility of the dentin and utilizing the wedging principle of gold foil flowing under compacting force. 1. Is necessary to enable access during preparation of cavity and for compaction of foil. 2. Due to restricted occlusal access, a mechanical separator is placed for the preparation as well as for the insertion of the foil. 3. Sharp line angles and point angles and undercut retention form facilitate the placement and retention of the foil. 1. The enamel walls are planed true and smooth. 3. A very slight cavosurface bevel is formed on the occlusal cavosur­face angles, especially at the occluso-proximal angle of lingual margin where short enamel rods are likely to occur because of the proximity to the mesial spillway (Fig. 63). 4. Occasionally the gingival cavosurface angle will require a short bevel to avoid short, unsupported enamel rods. 5. The cavosurface angle presents a continuous smooth line devoid of irregularities.